Through PMO case studies from high-performing PMOs, operating within major enterprises, this book both explains and illustrates the practical implementation of PMO principles and theory. Eight case studies demonstrate how PMOs are positioned organizationally at the executive-level and function successfully within various enterprises. Through PMO case studies from high-performing PMOs, operating within major enterprises, this book both explains and illustrates the practical implementation of PMO principles and theory. It provides answers to tough management questions such as “How do I gain executive support for chartering a PMO?” “What are the best practices for measuring project success?” “How do you create a sustainable PMO?” Eight case studies demonstrate how PMOs are positioned organizationally at the executive-level and function successfully within various enterprises. Key information required to establish and operate a sustainable executive-led PMO is artfully provided by allowing the reader to benefit from the experiences of others who have improved the performance of their projects, project-programs, and project-portfolios to maximize their business related value and benefits delivered. The PMO case study model and framework employed is a powerful tool that works as a facilitator vehicle for the analysis and implementation of any PMO organizational strategy. This book offers practical examples of lessons learned that are valuable whether your enterprise is considering creating an enterprise-level PMO or already has an established PMO and is looking to provide sustained value and benefits. The book, The Power of Enterprise PMOs and Enterprise-Wide Project Management, established the Project Management Organization, the PMO, as an executive-level functional business-organization within enterprises, that desired to achieve business leadership positions within their industries. This executive-level implementation was confirmed by the book A Compendium of PMO Case Studies – Volume I, which contained eleven enterprises, and it continues to be confirmed by this Volume II set of eight executive-level PMO Case Studies. 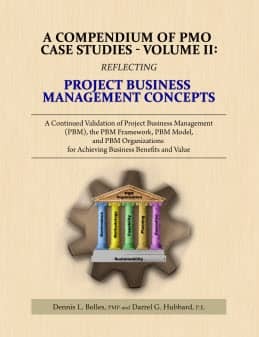 In addition, these case studies emphasize that the PMO of yesterday never was, the PMO of today is not, and the PMO of tomorrow never will be just simply an “office.” The PMO is, was, and will continue to be a functional “organization” for the business management of projects, project-programs, and project-portfolios, which is a Project Business Management Organization. The premise that an executive level, enterprise-wide Project Business Management Organization™ (PBMO™) should be created to implement and employ a Project Business Management Methodology for the management of diverse, resource intensive, and strategically aligned portfolios, programs, and projects across an enterprise, is viewed as simple, yet brilliant by readers of three related books – Building Project Management Centers of Excellence, The Power of Enterprise PMOs and Enterprise-Wide Project Management, and A Compendium of PMO Case Studies – Volume I.